Abandoned by your web guy? 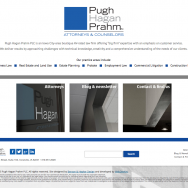 PughHagan.com was another collaborative effort with the amazing Robyn Hepker of Benson & Hepker Design! Robyn created an interesting design for a law firm — not the easiest thing to do, by far — and I made the design come alive. The most interesting aspect of the site, in my humble opinion, is the way the information about each attorney is presented. Instead of smacking you in the face with a bunch of words listing accomplishments or education, we tucked everything nicely away behind a clickable link. If you want to know more, it’s easily available. And once again, I used WordPress as a platform to make it easy for the client to maintain areas of the site. The result is a fantastic looking website that’s also flexible! Sign up for hosting with KevHost today and get FREE setup! That's right, we'll waive the $25 setup charge if you buy one year of web hosting services for only $99. Contact us for details or to sign up today. Hurry... this offer could end at any time!